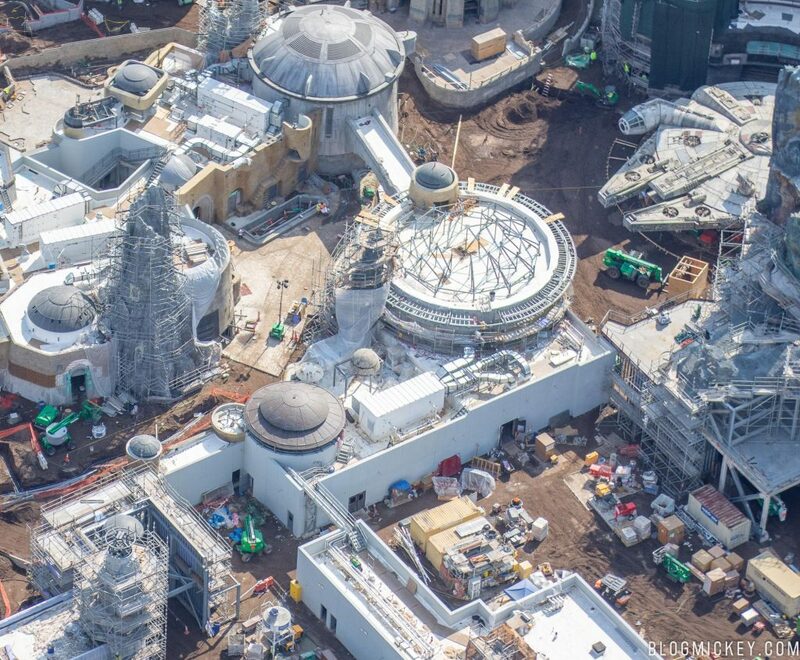 We recently took to the skies over Walt Disney World to get a bird’s eye view of various construction projects. 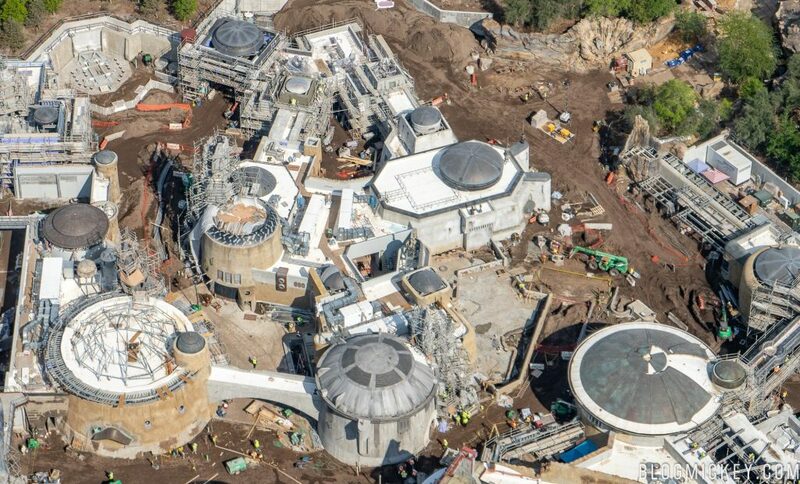 This morning, we’re going to start with a look at Star Wars: Galaxy’s Edge. This post also includes a wonderful interactive 3D map put together by Wes from Reverse Imagineering at the end. Be sure to stick around to check it out as it’s the best way to explore the land and get a feel for the space! 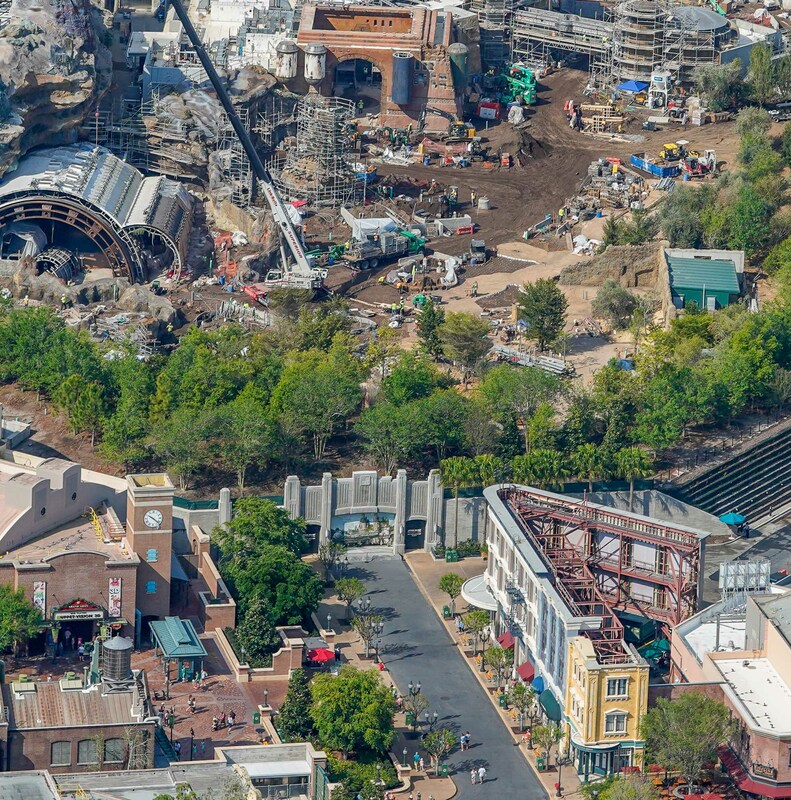 Excitement for the new land has been at an all-time high since Disney announced that it would be opening on May 31st in Disneyland and August 29th at Disney’s Hollywood Studios. 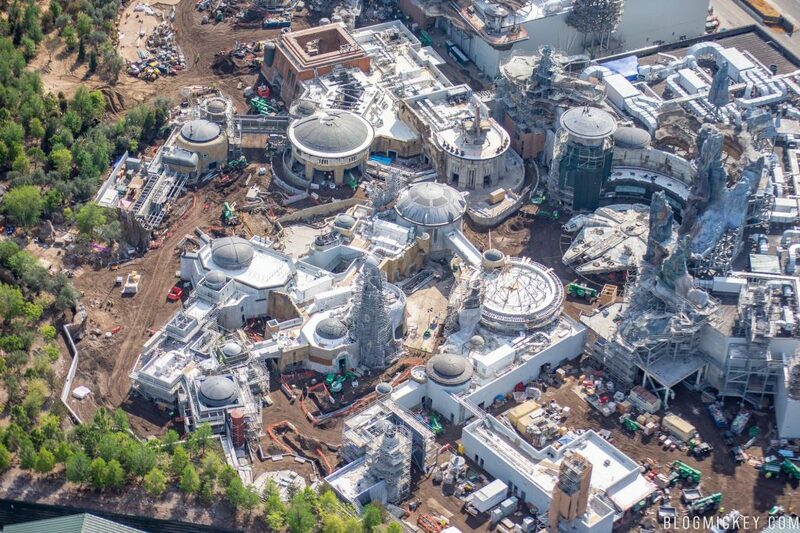 The 14-acre land promises to be the most immersive and impressive that Disney has ever built. 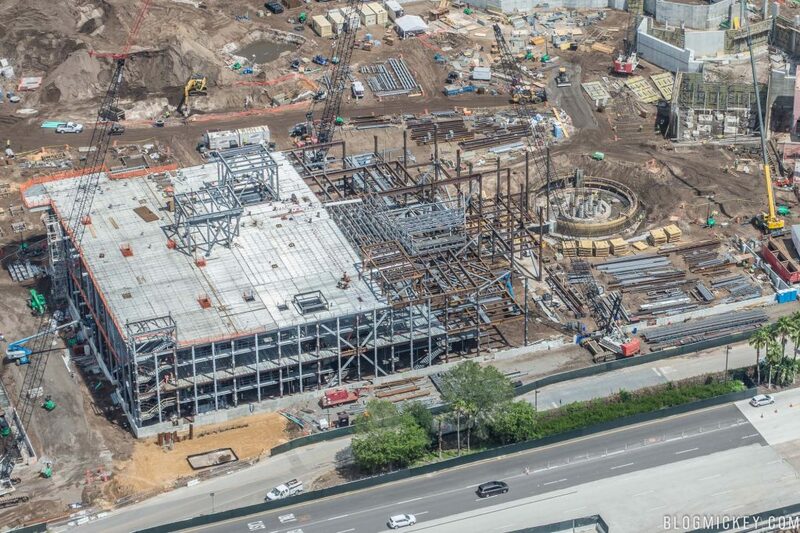 The land houses two attractions, Rise of the Resistance and Smugglers Run, that will throw guests into the middle of their very own Star Wars story. With a firm opening date announced, crews are working hard on completing the land, attractions, shops, and eateries. 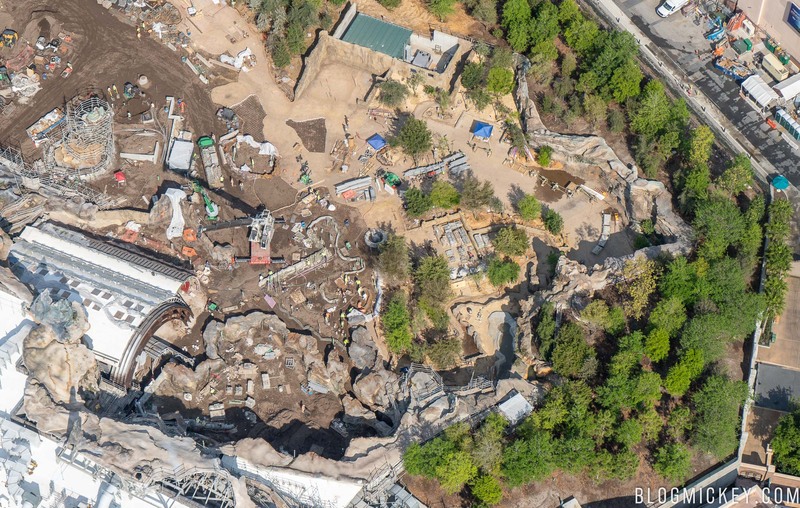 Let’s take a detailed look at each square foot of the land from high above Disney’s Hollywood Studios! We’ll start with a few overviews of the land, to give you a good idea of what it looks like as a whole right now. 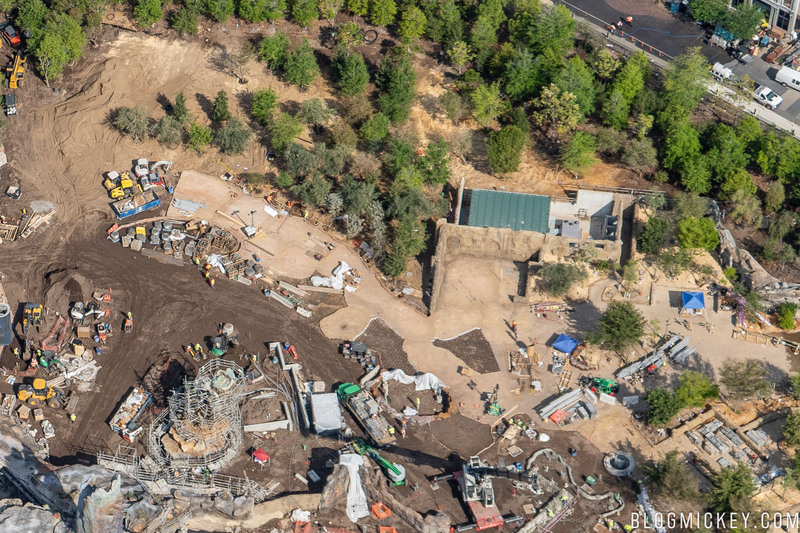 The first overview was taken from above Toy Story Land, looking south towards Star Wars: Galaxy’s Edge. From this vantage point, we can just about make out the two distinct sections that the land will have. The square, tan building in the middle of the frame is the dividing point between the Resistance forest to the left, and the Marketplace section to the right. The thought here is that Resistance fighters have left the Marketplace after the First Order set up shop. 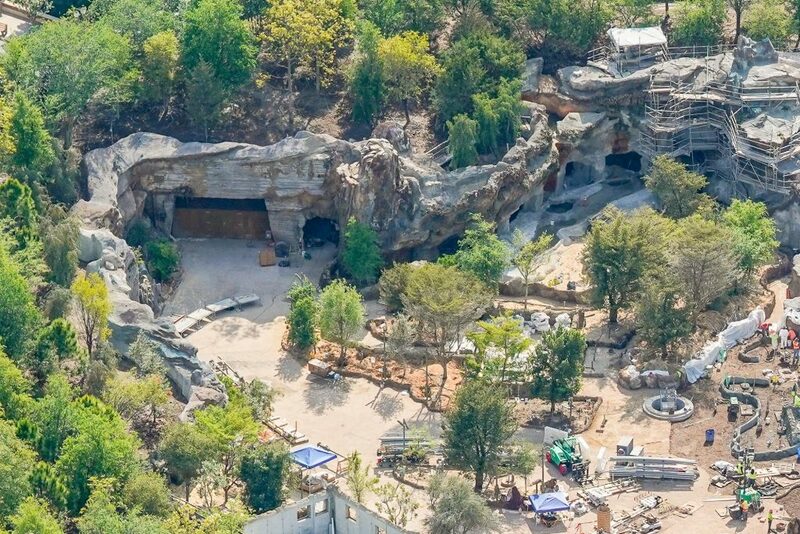 The Resistance moved out to the forest where they wouldn’t be found and they put together a makeshift base in the caves of Batuu. It’s in these caves that we will eventually find the Rise of the Resistance attraction. 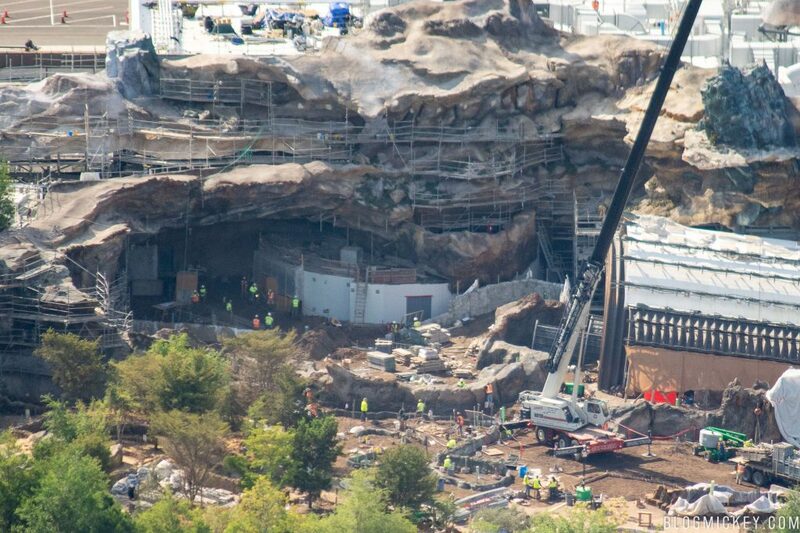 It’s worth noting that the attraction won’t open with the rest of the land on August 29th. Another overview comes from over World Drive this time, which means that we’re looking into the land from west of the construction site. 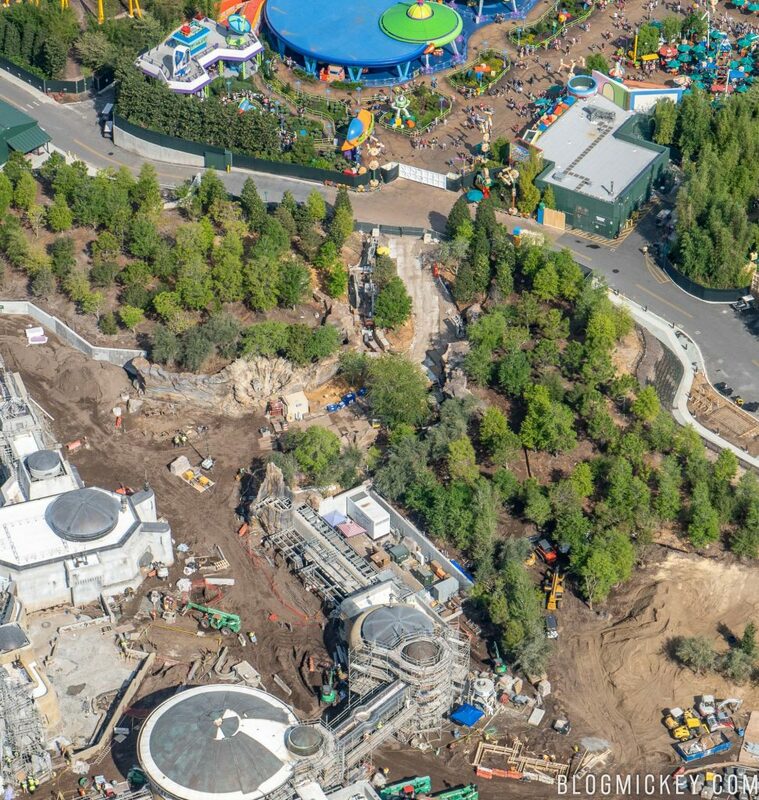 From here, we can see Toy Story Land on the bottom left of the photo as well as the pathway that will lead guests into and out of Galaxy’s Edge. The top left of the photo shows a small opening in the rockwork beneath a forest of trees. This opening will serve as the main entrance to the land and is accessed via Grand Avenue. It’s at this entrance that we’ll start our tour of the latest construction progress on the land. Here’s a reverse view of the above overview, with the Grand Avenue entrance to the land positioned below us and in the bottom center of the frame. From here, we can see the winding pathways a (soon to be) lush forest that guests will walk through as they make their way into town. 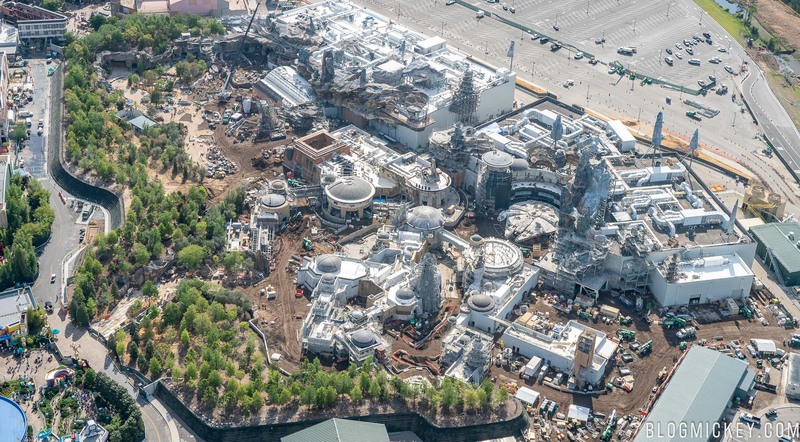 A tall view shows off Grand Avenue, a section of Muppets Courtyard, and the Resistance forest that guests will first encounter when entering Star Wars: Galaxy’s Edge. 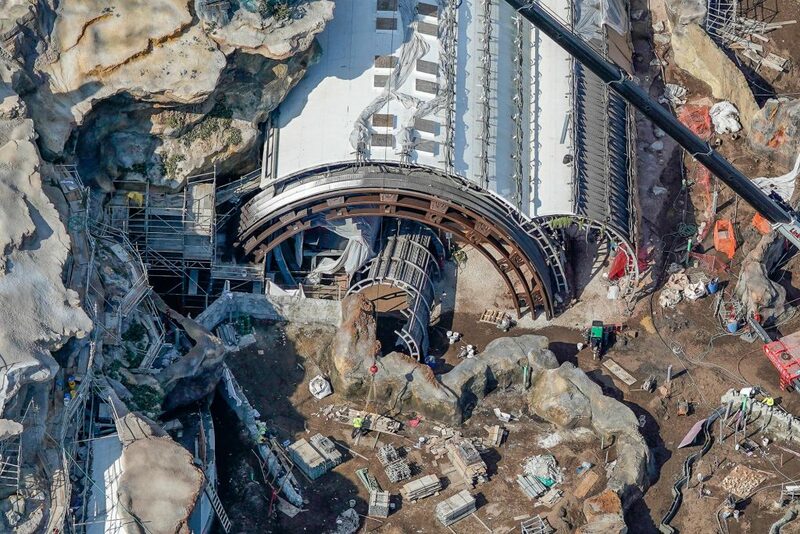 Here’s a look at what the tunnel will look like on the Galaxy’s Edge side of the berm. Guests will immediately enter the Resistance forest, which we will take a look at next. A nearly overhead view shows the Grand Avenue entrance on the extreme right of the image and the Restiance forest in the center of the frame. Here’s a wider, flatter view of the Resistance forest. 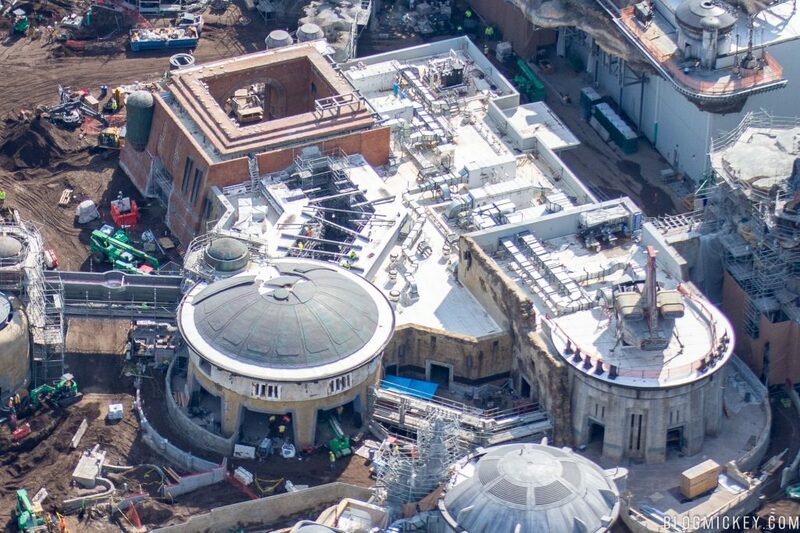 As noted above, this section of Galaxy’s Edge is where the Resistance will hide out to plan their counter to the First Order taking up residence in the Marketplace. 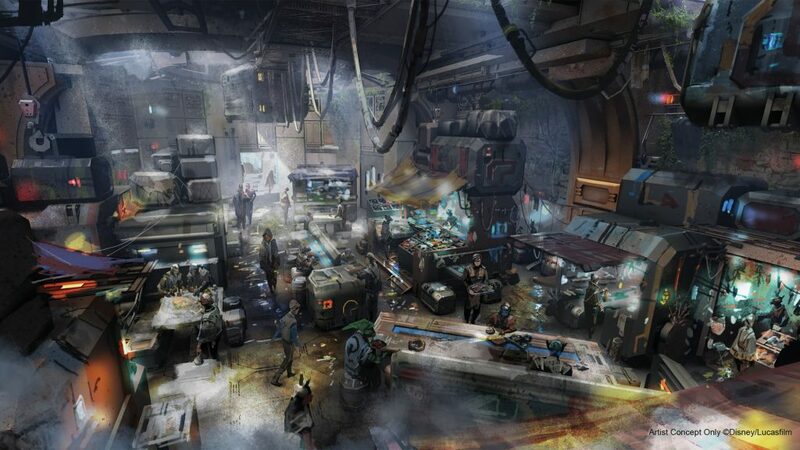 They use ancient ruins to set up a makeshift base of operations where they will recruit you when Rise of the Resistance opens later this year. In the photo below, we can make out a few construction elements. The most obvious is the ongoing pavement work taking place in segments. Pavement is a good sign as far as a milestone for the project is concerned as it signals that heavy machinery that might crack the pavement is no longer needed. Of course, the installation of trees is also a good sign and one of the things done towards the end of a project. If you direct your attention to the middle of the photo, you can see a circular element. 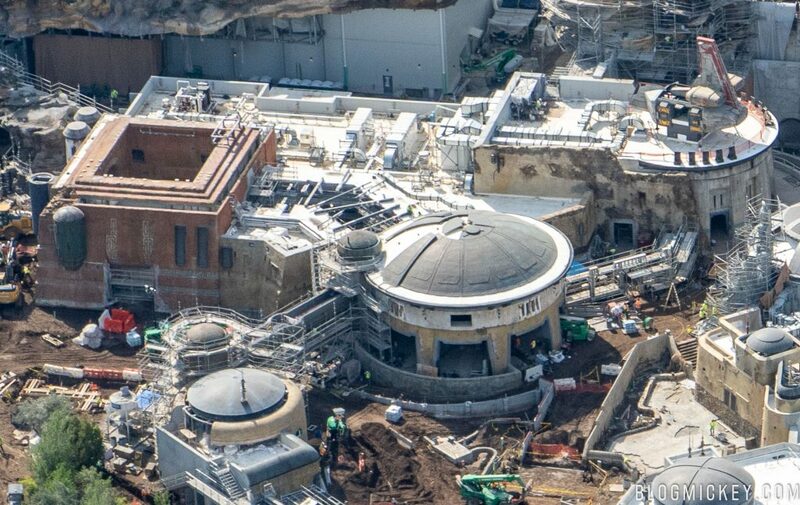 This will eventually be a turret and the entrance to the Rise of the Resistance attraction. Even though the attraction won’t be ready for opening day, we anticipate that all of the exterior work will be done and it will look “ready” to guests on opening day while work continues on the interior and ride systems. Next let’s take a look at what we can of the Rise of the Resistance attraction. This attraction will put you face-to-face with Kylo Ren as you try to escape the First Order. 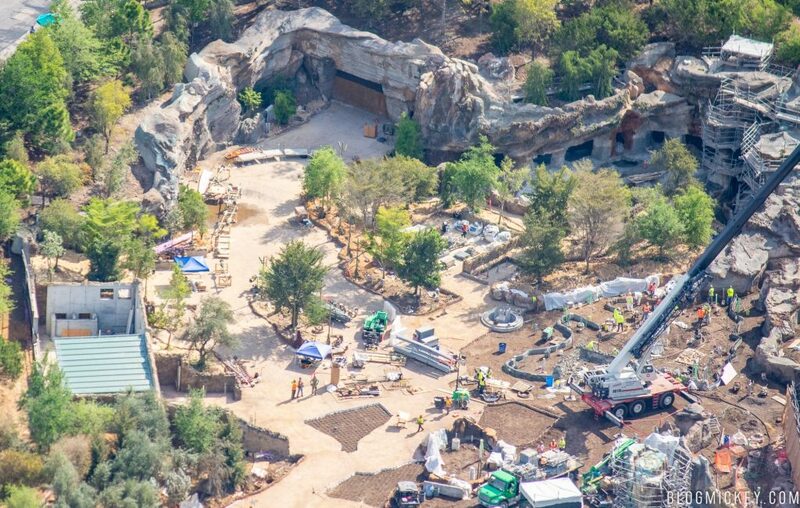 The Rise of the Resistance attraction will have an exterior queue, but it’s said that the majority of the queue will be indoors in a system of caves that the Resistance as turned into a base of operations. 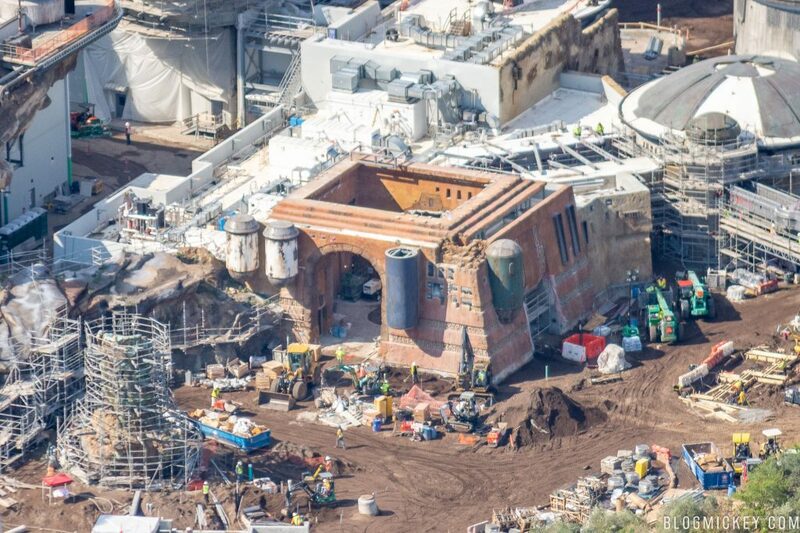 A nearly straight down look at the exterior portion of the Rise of the Resistance queue. 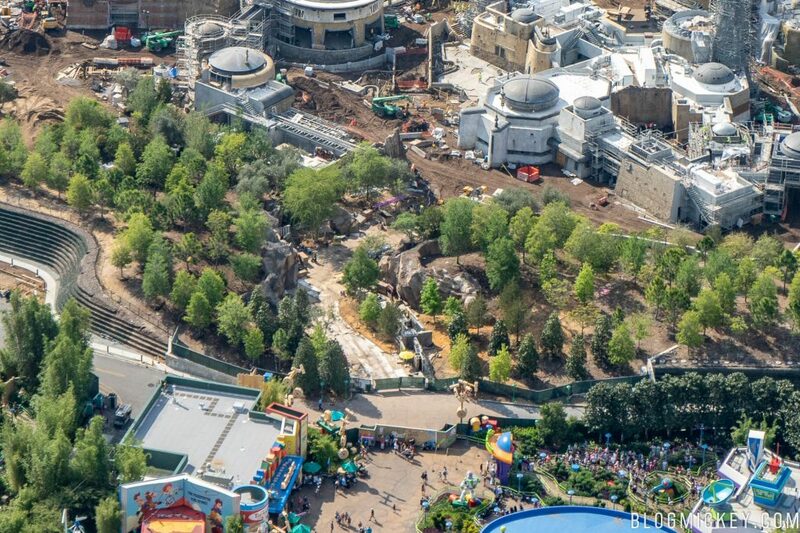 Spot the circular foundation slightly above the middle of the image to find where the queue entrance will be when the attraction opens later this year. Adjusting slightly allows us to see into an uncovered portion of the Rise of the Resistance attraction. This circular structure will act as a turntable, transfering guests from the Resistance caves to the Star Destroyer hangar. 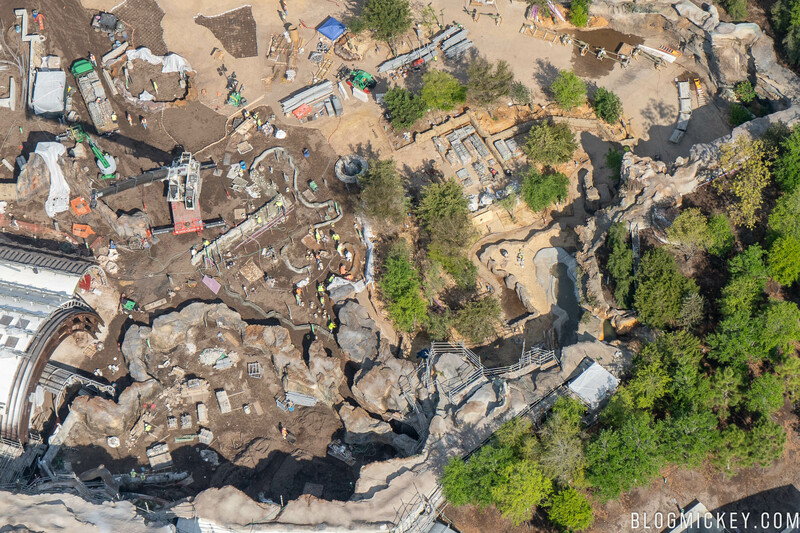 Guests will exit the attraction via the crashed remains on the right side of the image. Guests will likely board the transport ship within the turntable near where the construction crews can be seen below. The turntable should complete a 3/4 turn and unload guests into the Star Destroyer hanger in the show building on the opposite side of the turntable as we see it. An older aerial photo shows the pit that the turntable is set in. The photos below were taken in August 2017. The pit can be seen on the right side of the image below. When we compare the image below with the overview image two photos above, we can see how massive this show building truly is. 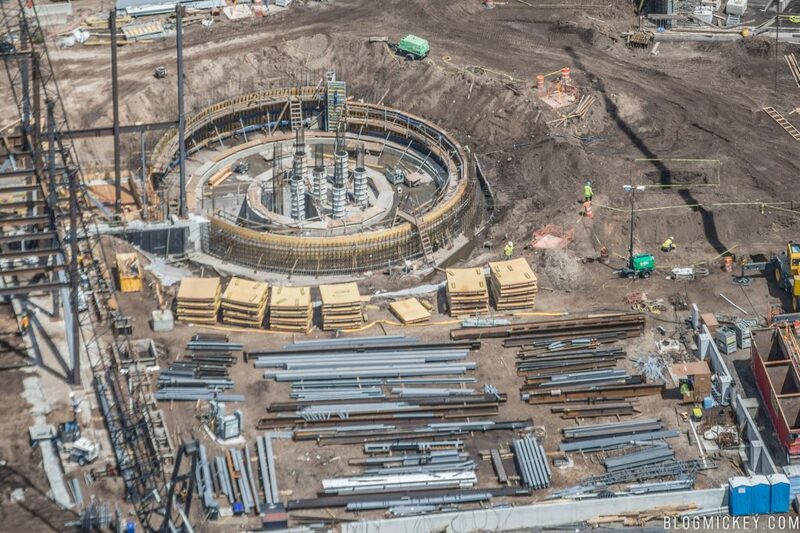 A closer look at the turntable pit early in the construction of the attraction. 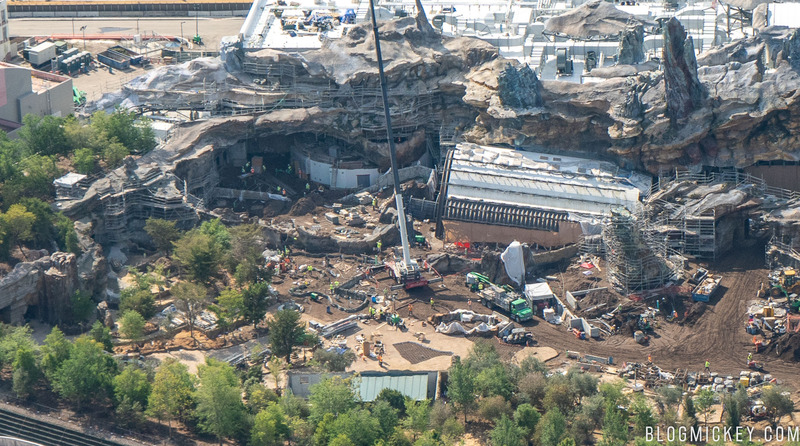 Back to today, here’s a look at the crashed remains that will act as the exit to the Rise of the Resistance attraction. The only other visible element to the Resistance forest will be some ships parked in the space below. 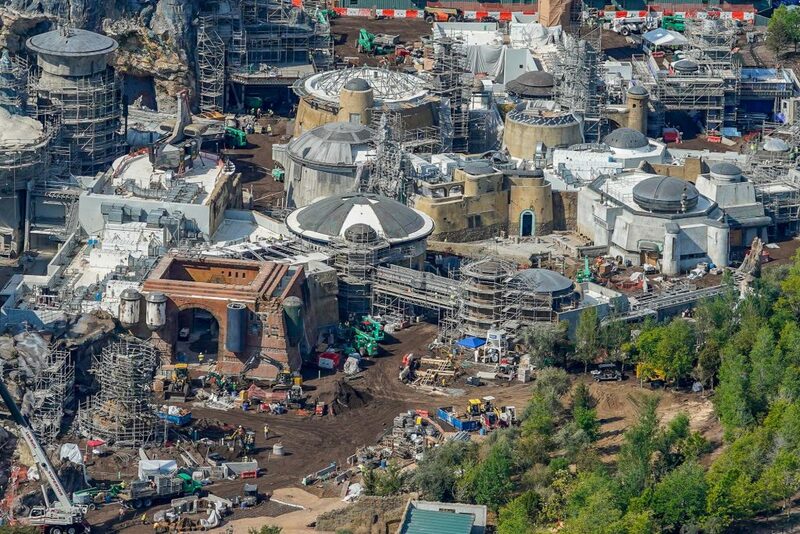 We’ll shift our attention to the Marketplace section of Galaxy’s Edge now, where most of the action will be taking place. 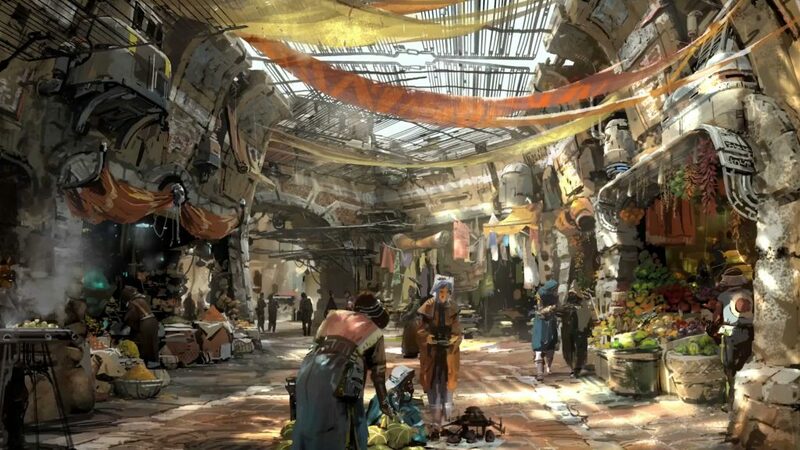 It’s in the Marketplace that you’ll find shops, dining, and the Millennium Falcon: Smugglers Run attraction. 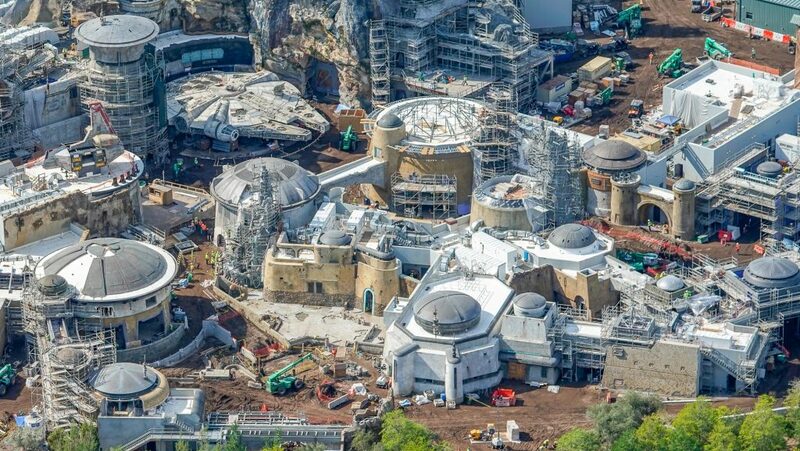 This will be the only attraction open on August 29th, with Rise of the Resistance scheduled to open later this year. We’ll start with an overview of the Marketplace and Smugglers Run attraction. As seen below, the Marketplace will start at the square, tan building on the left and progress to the right side of the image. The square, tan building will be the start of the Marketplace, and house outdoor vendors seen in the concept art to follow. At the end of the complex of structures is a domed-roof building. This will be home to Ronto Roasters. 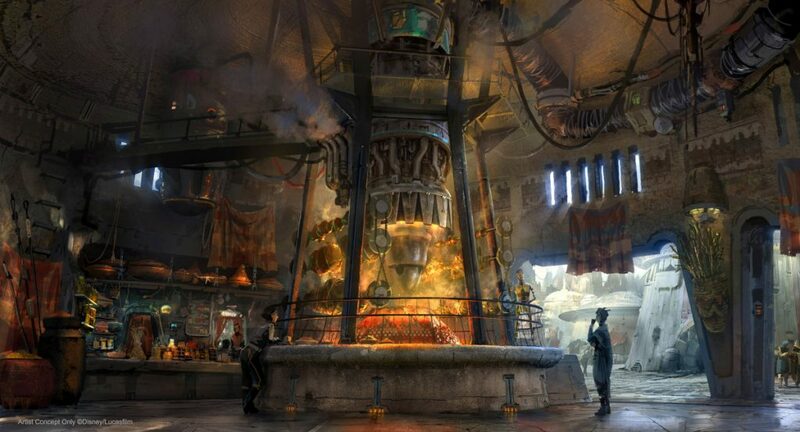 At Ronto Roasters, you’ll be able to find roasted beef items cooked under a podracer engine. Finally, if you’re looking for a more well-rounded meal, you can head to Docking Bay 7. Docking Bay 7 can be seen below as the structure on which a cargo ship has landed. Here’s the concept art for the locations mentioned above. Moving on, we come face to face with the fastest ship in the galaxy, the Millennium Falcon. This was our first time seeing the Falcon from the air in person, and it’s extremely impressive. The attention to detail is wonderful, and its placement amongst the petrified trees at Ohnaka Transport Solutions is tailormade. We can see some buildings are further along than others. The petrified tree seen in the photo below is one of the namesake “black spires” that the locals used to name Black Spire Outpost. 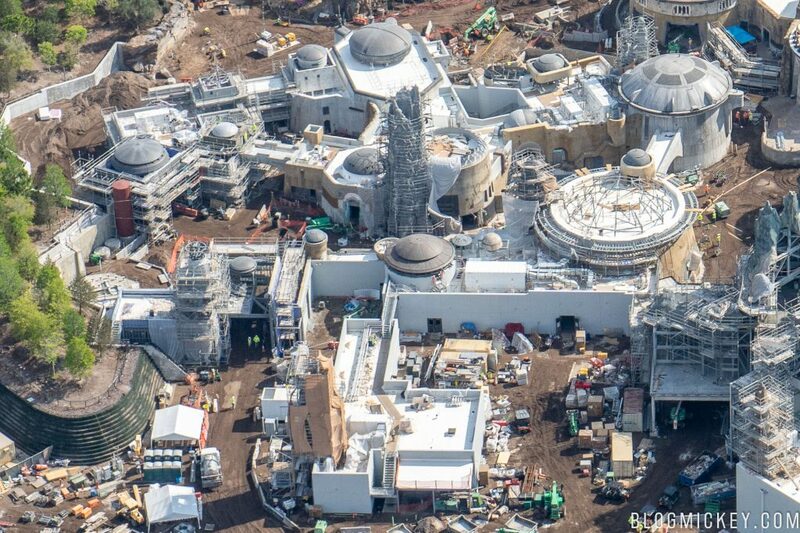 Here’s another overview of the Marketplace section of Star Wars: Galaxy’s Edge. 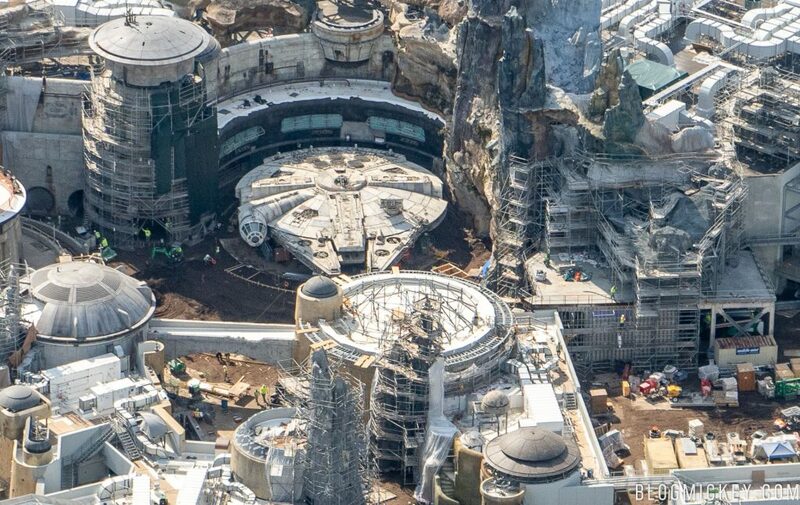 Another view from over top of the Millennium Falcon, looking at the Marketplace area with Oga’s Cantina on the bottom left of the image and Ronto Roasters on the bottom right of the image. 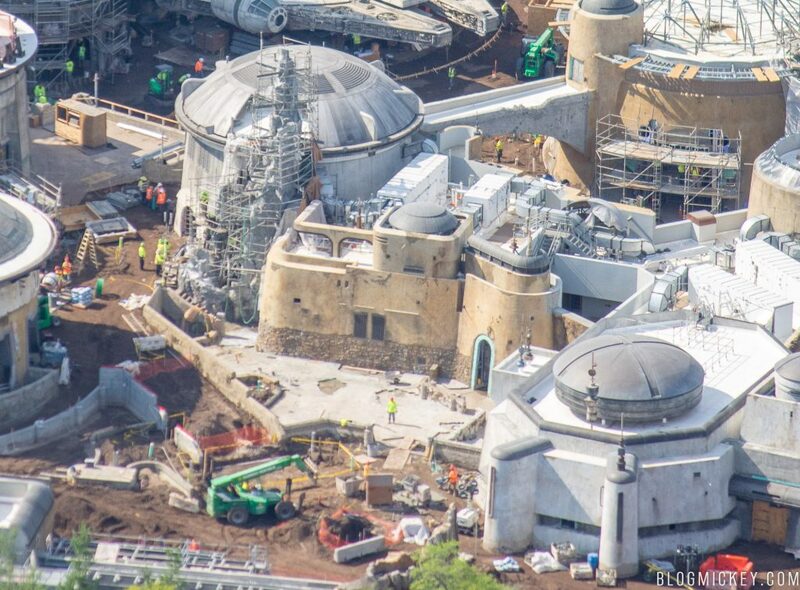 Directing our attention now to the structure in front of the Millennium Falcon, we find Oga’s Cantina. 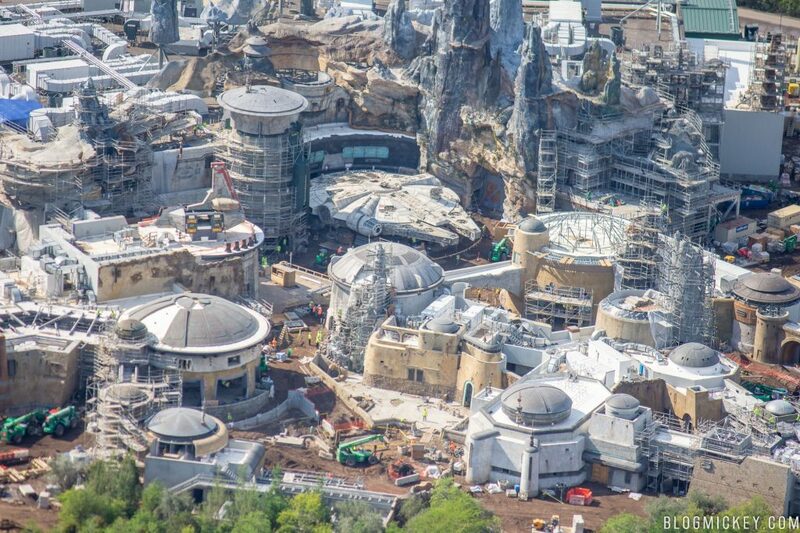 This local watering hole will be the spot to grab a drink in Galaxy’s Edge. For a look at all of the drinks offered, check out our in-depth post on the bar and lounge. The photo below is actually quite interesting for a few different reasons. First, we see the normal construction progress taking place such as the roof being prepared for a dome installation and pathways being poured, but we also notice something else. Or rather, the lack of something else. Back when Disney ran their Disneyland 60th Anniversary special on ABC, they touted a table service experience that would also include a show. 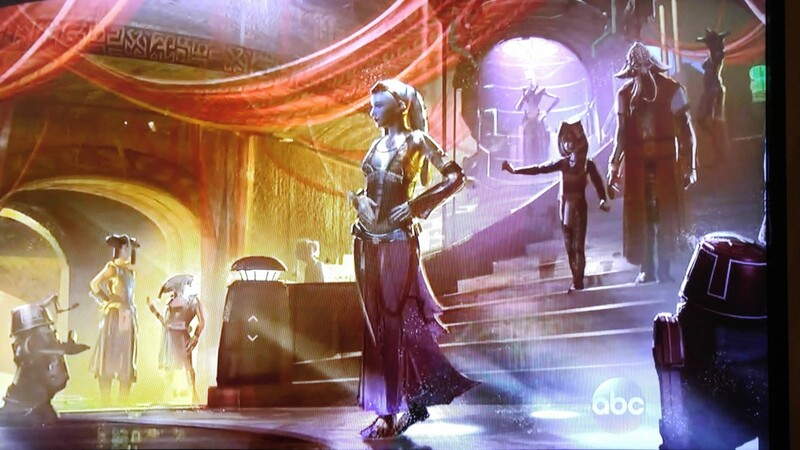 From all of the materials that Disney has put out, it would appear that this dinner show has been cut from the final plans. 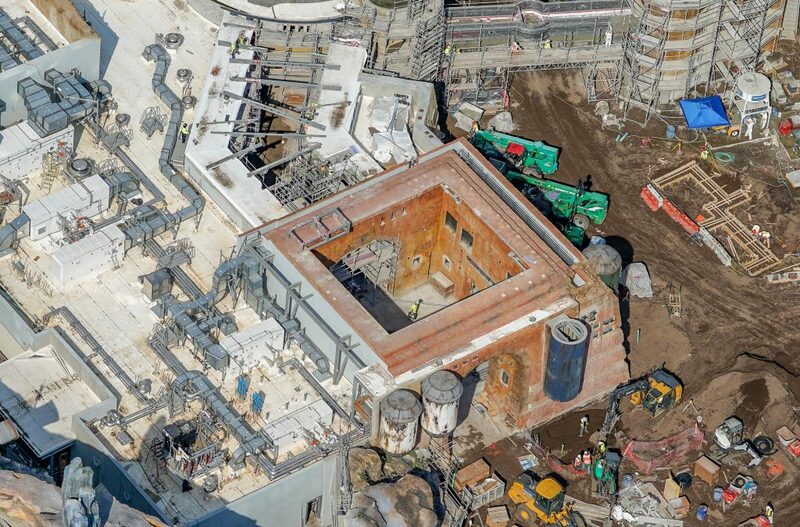 If you notice the chunk of space behind Oga’s Cantina below and wonder why Disney would construct something so oddly shaped, we’re told that it’s because this area of nothingness was where the dinner show was supposed to go. Of course, from inside the land you won’t notice this at all, but from the air it looks like something has been literally cut out of the plans. 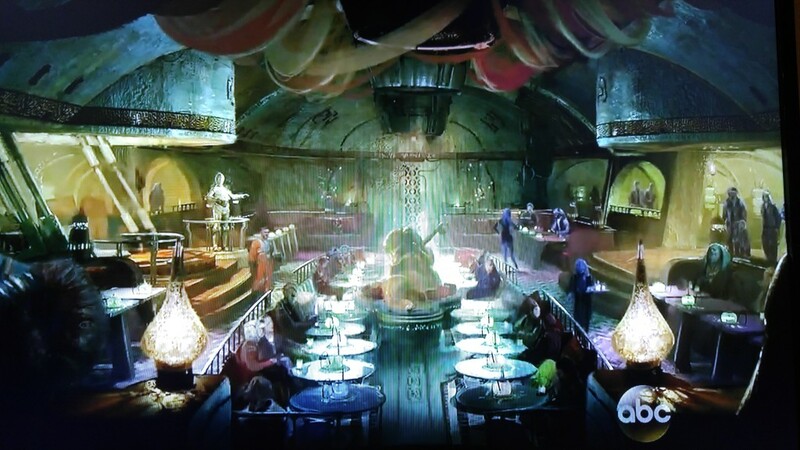 Here’s a look at the concept art for the table service restaurant that has been cut from Galaxy’s Edge. Just like in the Resistance forest, the space for a ship is prepared, but the all-new TIE Echelon fighter hasn’t been installed just yet. You can see the pad for the ship in the lower left of the image below. 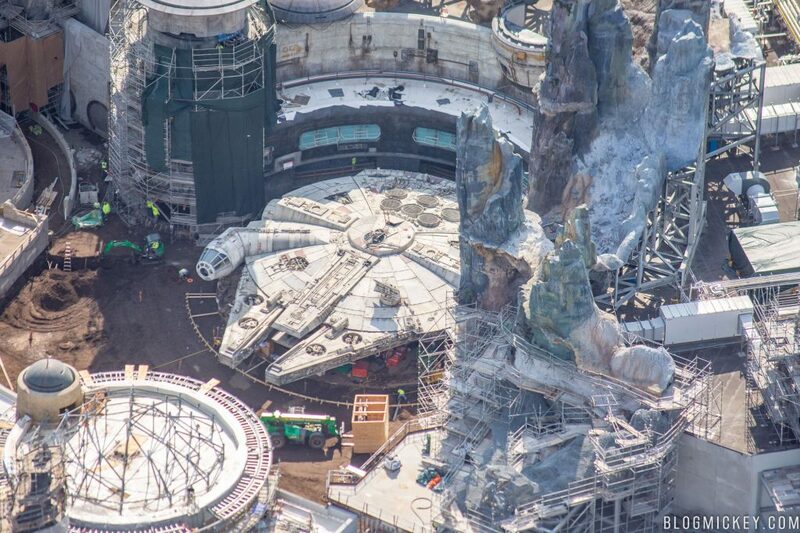 Another angle shows the pad for the ship a bit better. 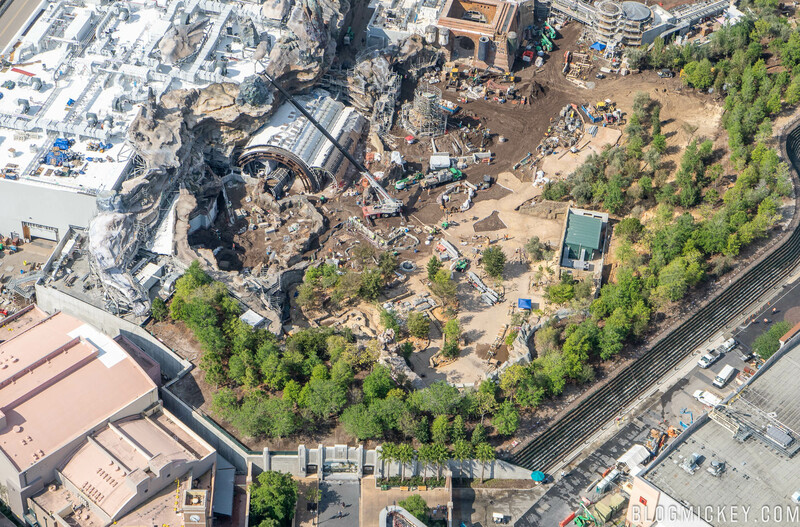 Before we conclude our aerial tour of Star Wars: Galaxy’s Edge, let’s take a look at the pathway between the new land and Toy Story Land. 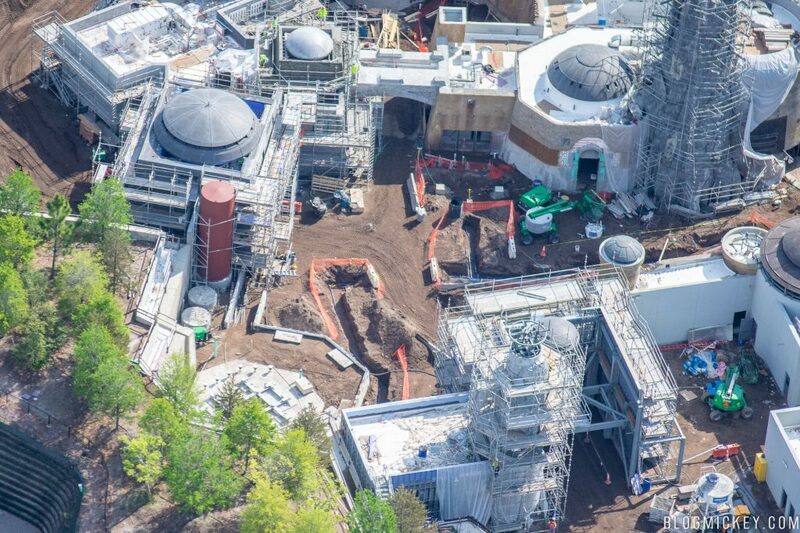 The winding pathway seen below will connect the Toy Story Land dead end near Alien Swirling Saucers and the middle of the Marketplace. We anticipate this being used as an exit only for Galaxy’s Edge when it opens until crowds die down. A reverse angle of the Toy Story Land path shows that guests will have to cross a backstage access road to transfer between the two lands. For whatever reason, Disney decided to not build the tunnel as seen in concept art. 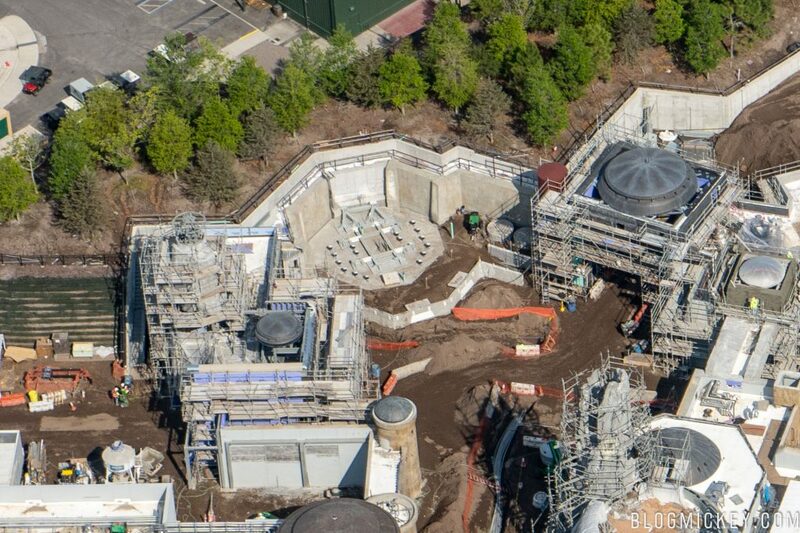 This could present an operational challenge as the road is used not only for a variety of food and beverage needs, but also to access the back of the upcoming Mickey and Minnie’s Runaway Railway attraction, which is rumored to be delayed until well after Galaxy’s Edge opens. We can see Toy Story Land K’nex railings have been installed beyond the current gate, but it will be interesting to see what else Disney can do (if anything) to make this feel like a thematically coherent transition and not just a walkway over a backstage road. 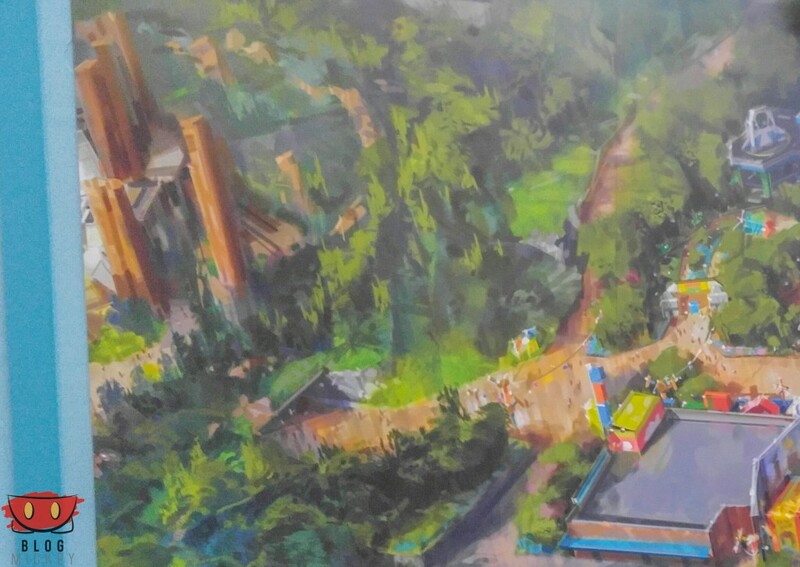 Here’s a look at the concept art that showed that a tunnel would act as the transition piece between Toy Story Land and Star Wars: Galaxy’s Edge. Specifically, we’ll focus on the left side of the concept art. 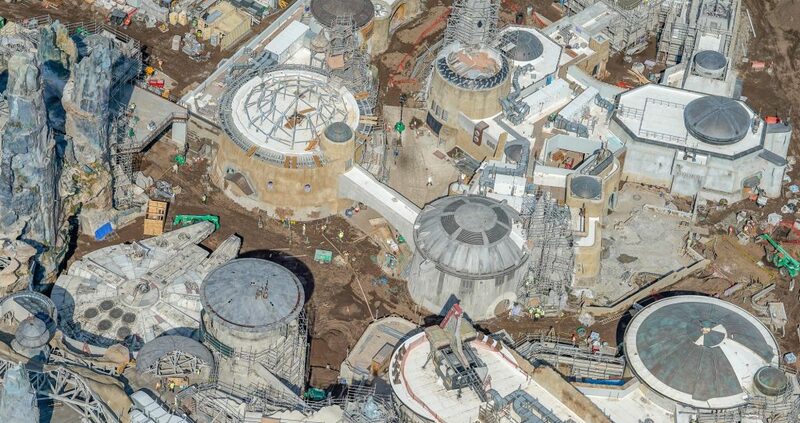 Finally, here’s the awesome interactive 3D map of the construction site as of April 6th! Wes from Reverse Imagineering does an absolutely amazing job creating this map and provides the community with a very unique way to explore the construction site above and beyond static images and commentary. Be sure to visit ReverseImagineering.com for even more great content! 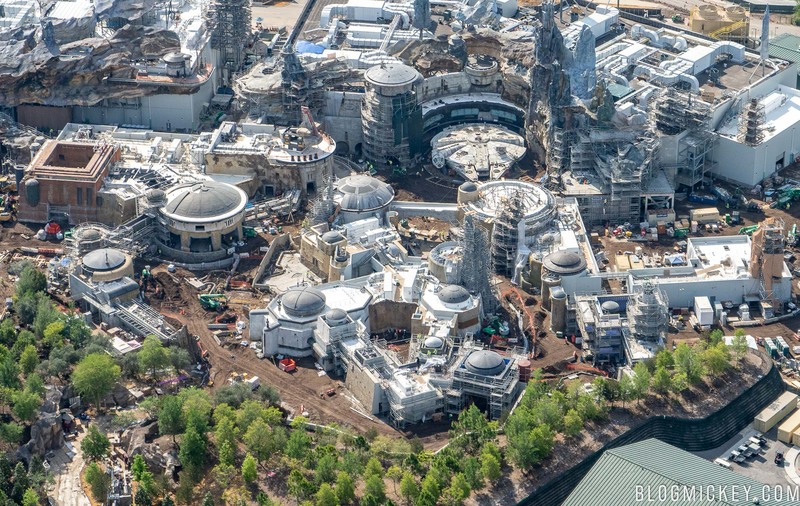 Thanks for reading and please continue to check back with us as we post more aerial photos this week and cover Star Wars: Galaxy’s Edge in great detail in the months to come.